It’s no secret, I have a lot of glasses. What can I say its almost like my “jewelry” for for all different outfits and moods that I am in. This is where OYOBox comes in! It is the most luxurious and beautiful way to store and protect your eyewear. Not to mention you can see all of your eyewear in one beautiful box displayed for you. These “homes for your eyewear” make absolutely great gifts for that special someone you know who has even just a couple pairs of glasses. OYOBox also has a line of “tech trays” and “smart watch boxes” which are very chic for the ultimate tech savy organization. OYOBox Mini. The cutest addition to your eyewear collection! 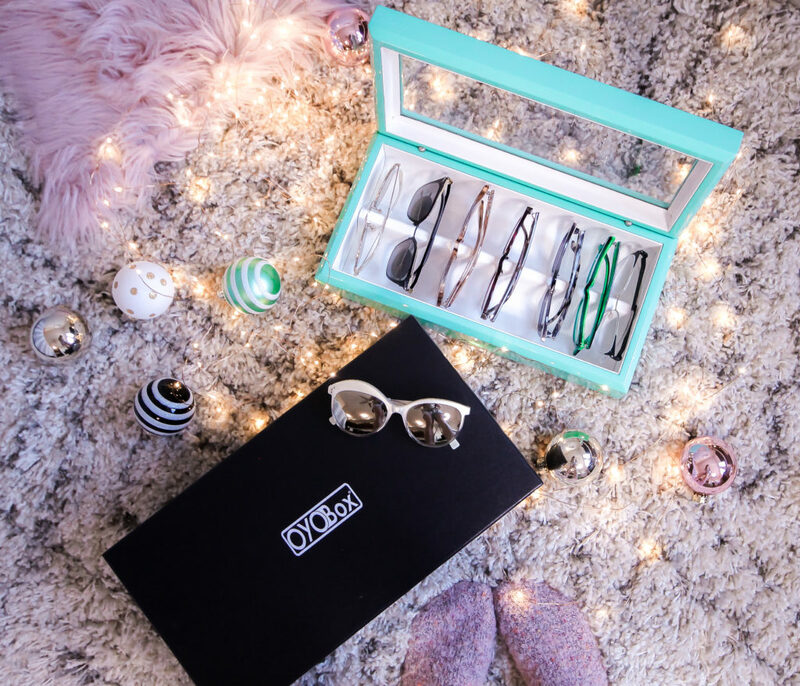 OYOBox was created out of necessity by a brother and sister team that purely loved their eyewear and felt the need to have a fabulous way to display their collection in an elegant way. Luba Stark and Michael Kriss are the masterminds behind this gorgeous way to be able to “see, choose, and wear” your eyewear. As an added bonus, this makes bulky cases that you normally receive with each pair of frames get stored away. I am a huge de-clutter individual. I love organization and ease and OYOBox does just that for my eyewear. There are many different sizes to choose from as well as beautiful colors and finishes. The aqua maxi box pictured below is just so beautiful. It is one of my favorite colors and was also one of my wedding colors! I absolutely love these handmade luxury boxes, from the packaging to the presentation and have teamed up with OYOBox to give one lucky winner one of their own! That is right, if you win, you choose which ever OYOBox you want! How to WIN an OYOBox of your choice?! Comment On The Instagram Post Your Favorite Holiday Movie! Already obsessed with OYOBox?! Feel free to shop away and use DISCOUNT CODE: ERIKA20 at checkout to save on your order! I love this box !! So glamorous yet so practical!! A perfect gift for the holidays !! Exactly! Its a great little gift! I love that gift box! It gives you so many options and those frames are super fun! Entered the contest! Really hope I win!!!! It really does! Good luck girly! These are such a great idea and so cute!! If I wore glasses, I’d take one of each!! This is too cool! I love eyewear but I don’t adventure out into new things nearly enough. I need to give this a try! Yes girl! Good luck with the giveaway! I love staying organized. These trays are amazing! Yes! Same here! These are great for that! Love that box babe. It’s so perfect for storing your glasses. And all those glasses look so beautiful I want them all. Thanks girl! It looks so pretty displayed for sure! What a fun gift idea! My husband needs this! He would love!! They have definitely some more “manly” boxes! I just love Oyobox! They really make an amazing and unique product that you can not find anywhere else. You know mine is pink and it matches my office perfectly! I highly recommend them along with you to anyone and think they would make a great gift! I think if forces people to actully take care of their glassess as well lol! Girl you just said it all! It really does keep them dust and grime free from just laying out not in a case! Good luck on the giveaway! These are such awesome boxes!! I’m crazy about things being organized and totally need to get like 5 of these for my hubby for Christmas! Oh this would be a great gift for him! This is a great box! The only reason I have two sunnies is because I don’t know how to store them! This is such a great solution for sunnies/eyewear storage! I also love your through review. It really is and also just looks so pretty displayed! Thanks girl! These boxes are definitely amazing. I need a good way to store all my sunglasses. Thanks for sharing this. You’re so welcome! Thanks girl!